For verbs ending in E there's a simple spelling rule to remember: just add D to make the verb past tense. This worksheet reminds kids of that while letting them practice spelling regular verbs in past tense, and finding the verbs in a word search. Introduce your child to the present progressive tense! Have him complete these sentences by adding "ing" to verbs so they talk about on-going actions. How do you change verbs ending in Y to past tense? Spelling practice gets some help with this writing and word search worksheet! This helpful worksheet puts verb tenses in context, helping students to see the patterns in verbs ending in Y! Study up on plural words ending in -ies and the spelling rule for nouns ending in Y. Changing verbs from future to present tense can be tricky for young learners! Give your students a grammar boost with this useful worksheet that puts skill practice in context. Practice how to spell certain verbs in present tense here! For most plural words, ending in S is the norm; this worksheet reminds readers of the spelling rule for other tricky words. This worksheet focuses on the spelling rule for -ie verbs and changing them to verbs that end with -ing. Create present tense verbs! Kids can put together the suffix -ing with the words on this worksheet like puzzle pieces to memorize common spelling patterns. 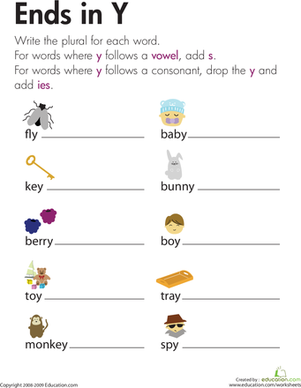 On this worksheet, kids practice changing singular nouns ending in "y" to plural by either adding "s" or dropping the "y" and adding "ies." First students will sort the verbs by their ending letters (vowel or consonant), then they'll write the plural form of each word.